Ian Schrager Hotels of New York is proposing a $25 million renovation which would make major changes to the resort. Click on the image above to view a larger preview of the new Miramar. With plans for a multi-million-dollar renovation nearly complete, this may be the last summer for the blue roofs and endearingly passe décor of the Miramar Hotel, a venerable presence on the South Coast for the past century. Although some procedural hurdles remain, the reconstruction at the prime Montecito property may get started next year, in time to have the project finished by the beginning of 2001. Coincidentally, that would be 100 years since Bamboo, the first of the resort's quaint seaside cottages, was built to accommodate more guests and bring greater profitability to the farm then owned by the English immigrants Josiah and Emmeline Doulton. After the Doulton family's ownership faltered during the Depression, the hotel was bought for $60,000 in 1939 by Paul Gawzner, an experienced hotelier from the East whose family controlled the Miramar for nearly six decades. That era ended when the 13-acre property at Highway 101 and San Ysidro Road was bought for $31.7 million last September by a New York-based partnership fronted by Ian Schrager. The once infamous Studio 54 co-founder now heads an international company of more than a dozen luxury hotels - including the whimsically elegant Mondrian Oil Hollywood's Sunset Strip. The new owners are Prepared to put about $25 million into the renovation work that will I do away with the Gawzners' roadside motel motif and restore a country spirit reminiscent of the Miramar's early days - and of the summer camp in the Catskill Mountains that Schrager loved as a kid in New York. They will also bring the novel concepts - such as "lobby socializing, and "hotel as theater' - that made Schrager's company the celebrated creator of "boutique hotels." Like the Mondrian in West Hollywood, the Delano in Miami Beach, and half-dozen addresses in New York City, Schrager's hotels are also popular hangouts, marked by striking d�cor and diverse architectural styles. "We don't really sell sleep and rooms, but we sell magic," said Philip Dailey, who has been with the partnership called Ian Schrager Hotels for four years. He became the Miramar's general manager five months ago. Dailey and Brian Cearnal, a veteran Santa Barbara architect working on the Miramar, spoke Thursday at the Santa Barbara Region Chamber of Commerce, and used a slide presentation to bring a small group of business people up to date on what's in store. Prior to submitting plans for the renovation to the county Planning department on Jan. 7, Schrager's representatives held numerous meetings with the hotel's Montecito neighbors, incorporating suggestions and garnering critical community support along the way. In addition, Cearnal said Thursday, the owners performed a variety of environmental studies that they hoped would persuade county planners to put their seal of approval on the renovation plans and send them on to the Planning commission for a vote. That hasn't happened yet. 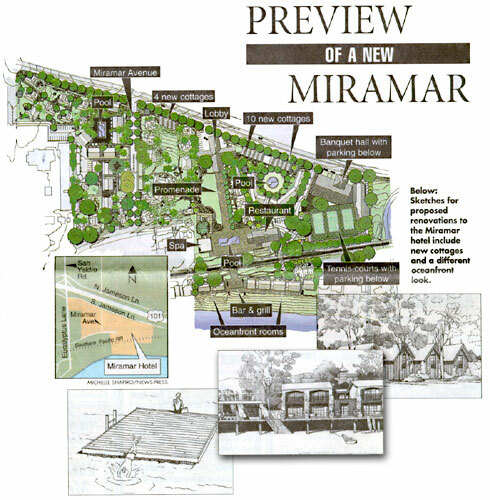 Cearnal said a variety of questions from the department have been answered, and he is hopeful that the owners' considerable advance footwork will enable the Miramar to reach the Planning Commission 's agenda by the end of the year, which would keep the 2001 completion date within the realm Of possibility. With key planning questions still unanswered, the owners haven't decided whether the resort will remain open during remodeling- as the 16-story Mondrian did - or close for about a Year, said Dailey, the general manager, who oversees a s I staff of 150 and intends to give the employees ample notice. The plans for the Miramar, as submitted to the county and elaborated on at the chamber meeting Show considerable changes in the hotel's look and layout Yet few Of the existing cottages will be moved and the total number of rooms will remain at 213. Perhaps most strikingly, the blacktop that covers about half the Property will be replaced by walkways and the kind of lush gardens that were a point of pride back in the Doulton days. "It was a very elegant place," Dailey said. "It was beautifully landscaped and it's time it went back to that." The newly designed and rebuilt lobby, banquet hall and restaurant, along with 14 new cottages along South Jameson Lane, will have rustic board-and-batten exteriors to further evoke the Miramar's farmhouse origins. The new lobby will line up with a boardwalk promenade that leads straight to the beach. At the end of the promenade, just below the boardwalk a beachfront bar and grill is planned. The boxy Miramar Convention Center, converted from a parking garage in 1957, will be torn down and rebuilt into the banquet hall A single level of Parking will run underneath the hall and the nearby tennis courts. Toward the beachfront end of the Promenade, a main swimming pool will by added, flanked to the east by the new restaurant, and to the West by an 8,000-Square-foot spa with a gym, juice ice bar and about 20 massage rooms. The number of oceanfront rooms, currently will be reduced to 26, partly to make space for the Promenade, and partly because about half the rooms will I be converted into two level suites. Rates for the renovated Miramar have not yet been established. While the oceanfront rooms may fetch the highest prices - similar accommodations at the Delano in Miami Beach cost between $575 and $1,000 per night - the Miramar has a variety of room types and the owners plan to make at least some available for about $120 per night, a nod to the hotel's tradition of relatively low rates. While many Schrager hotels enjoy a celebrity following and May have prices to match they are also meant to reflect their surrounding, and attract a mix of people. It's all part of the concept of hotel as theater. Thus the public would be free to join in the show and stroll through the Miramar Property, dine at the restaurant, have a drink at the beachfront bar or schedule a massage at the spa. At the Delano, where Dailey previously worked, he explained that it would not be unusual to find a star like Sylvester Stallone or the super-model Naomi Campbell "and a couple from Tulsa, all in the same group, all playing Pool and drinking cosmopolitans."